Here are my favorites from the 2018 Fair. Many of these are practical solutions that will enhance any project, and a few are just plain fun. Day One – lots of ground to cover. The coolest both was by Buster and Punch , 2 British architects who design everything from motorcycles to accessories. HearthCabinet is the only approved gel fuel fireplaces in New York. They had some funky designs as well as some that can beautifully integrated. Coolican and Company has produced this simple, modern take on the Windsor Chair. WATERMARK has the most beautiful options for their new collection of faucets. Brass rules! This ewer by Otto Prutscher, Krug, Entwurf is from the 1930’s. The Wiener Silber Manufacturer has made gorgeous cutlery and accessories since 1882. This stone vessel sink by Stone Forest brings new meaning to the phrase “jewelry for the home”. And finally, Melody Rose made us chuckle with her insouciant tableware. 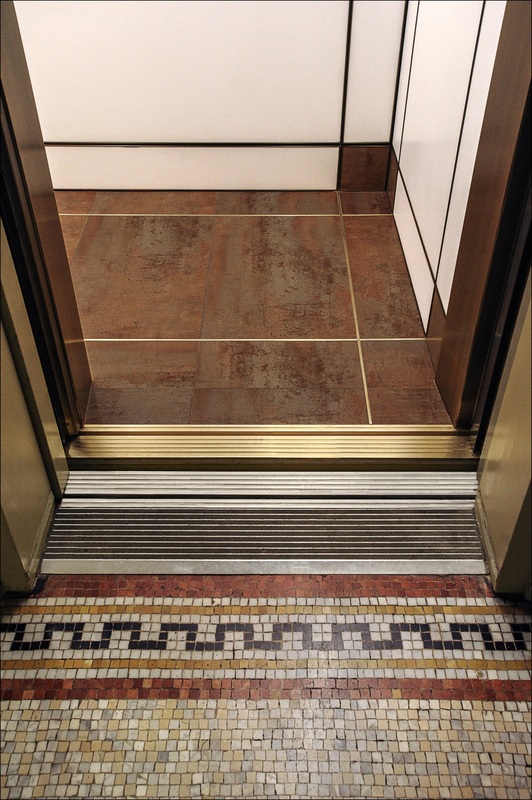 I recently redesigned the elevators at The Townsend Building at 1123 Broadway, which is a historic building in the NoMad neighborhood of Manhattan. Kew Managment featured this project on their website, which I include below. The building was designed in 1896 and has Historic Landmark Status. There are great architectural details inside and out. I chose to draw cues from both the original structure and some of the changes that have occurred over the last 120 years. You can see from the photos that there are many gorgeous details that remain. The lobby walls are Calacatta marble, with gray accents and there are details in the floor of a copper colored stone. This is where I drew inspiration for the elevator materials. I interpreted this with a man-made product from Porcelanosa that will be extremely easy to maintain, as it is not porous like stone. There are elegant brass reveals that I used in between stone in the same manner. 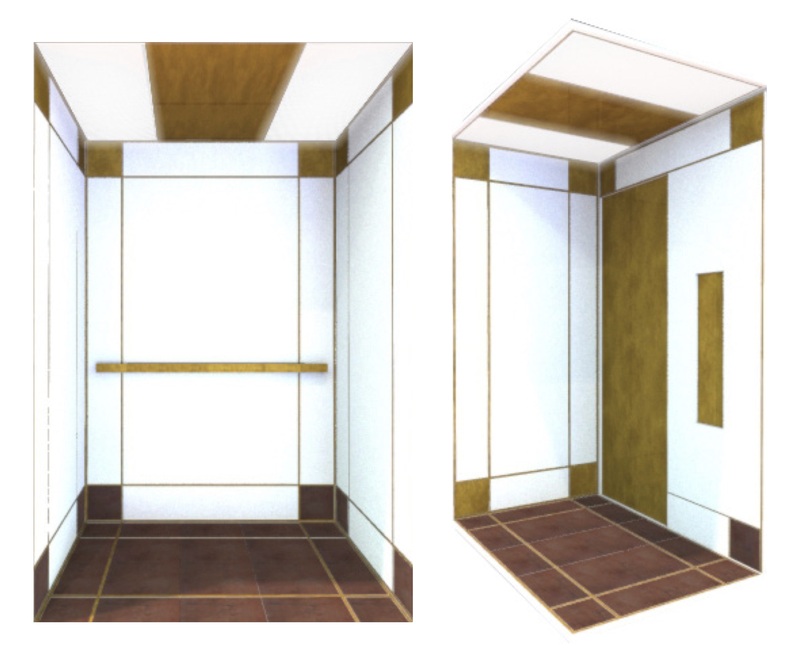 The design intent was not to replicate the past, but to create a bright, modern elevator that uses cues from the existing, yet feels fresh and new. The new elevators which have given this building a lift. The article below from Kew Management explains more. 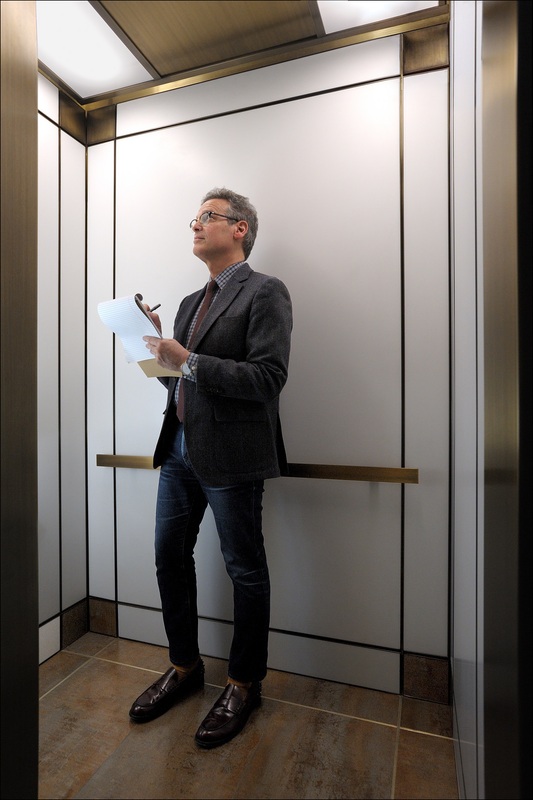 The elevators in the historic Townsend Building, 1123 Broadway, have been reconceived by architect and interior designer, Barry Goralnick. Goralnick was inspired by architectural elements, details, and aesthetics from the Cyrus L.W. Eidlitz building built in 1896: its gracious lobby is sheathed in white marble, bronze colored stone details on the floors, brass reveals that frame the exterior of the elevator doors, and the square wooden corner elements on the mirrors opposite the elevators. For those who knew the elevators now being replaced, the transformation is remarkable. 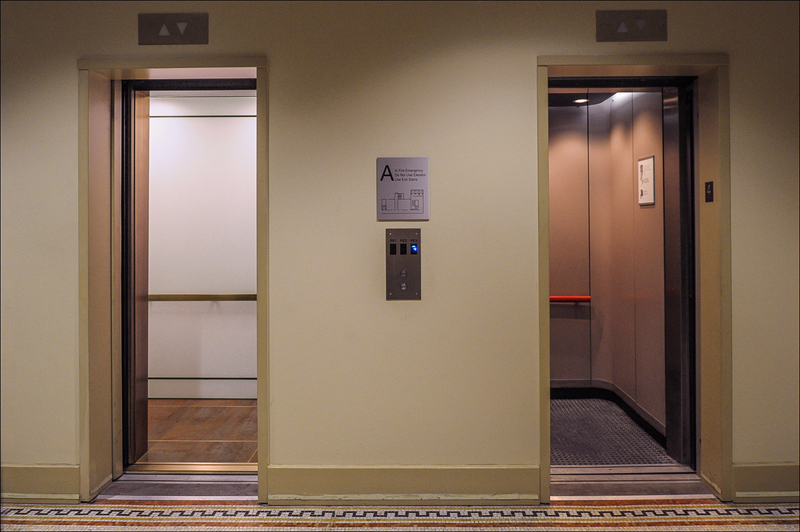 The updated elevator cabs are handsome and true to the spirit of The Townsend and its lobby. The fresh look of the cabs emphatically reflects the faster, more efficient service delivered by the new elevator system, equipped with the latest technology. In a simple stroke of genius, Goralnick literally created more standing room by replacing the over-scaled back railing that made the cabs feel even smaller. The previous cramped feeling of The Townsend Building cabs, with muddy colored curved walls and dim incandescent lighting has given way to a fresh new look – bright and clean – with a design that both preserves and advances the building’s aesthetics. Barry Goralnick, a graduate the Harvard Graduate School of Design, is a tenant in the St. James, 1133 Broadway. His first job at Wayne Berg Architects was at 1133 Broadway, before it became the NoMad we know today. In addition to architecture and interior design, Barry also designs home furnishing products for Visual Comfort Lighting, Stark Carpet, Vanguard Furniture, and Ferrell Mittman Furniture, with new categories constantly gestating in his studio/lab on the eleventh floor. Barry has honed his signature style of “Blended Modern” into a nationally recognized lifestyle brand. His essence captures a luxurious style of casual living. Simple lines, rich materials & textures, and distinctive comfort are inspired by the quintessential classics. Modern and Classic design elements are reinterpreted for a softer, more casual livable kind of modern design. You can learn more about Barry on his website at http://barrygoralnick.com and on Kew’s website at https://www.kewmanagement.com/barry-goralnick-master-class. Yesterday I toured the AD Home Show on Pier 92 in Manhattan and picked a dozen of my new favorite products. Some of them are practical and some are decorative, but they are all pretty exciting. New Crystal Sink from Franke with Glass Panel covering the drain. Because who wants to see the drain? Whimsical Wallpaper from Nottene. This one is from Scandinavian towns. Great for a kid’s room. Ilve makes appliances in a host of colors with different metals. Everyone knows I am a fan of gold. Gorgeous White Plaster Wall Sculpture with Gilding by Ben Watkins of Providence. And this was my favorite dining room at Dining by Design for DIFFA. By Gensler and Associates, this setting was lovely and poetic – the spectrum of rainbow colored paper cranes signifying peace and understanding.